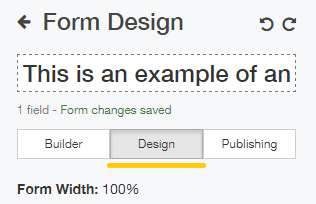 If form requires a logo, or any other type of image above it. this article is for you. Blitzen makes the change on a form-by-form basis. There is no way to do this for all forms at once. Scroll down to find the Custom Header Image textbox and paste your image link into it. The preview will appear on the right. If you do not have an image link see this article for steps. Changes will auto-save. To delete the image delete the link.